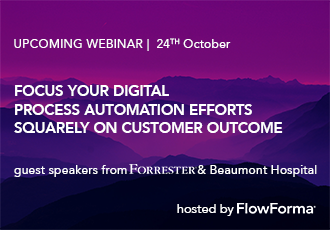 FlowForma®, the the leading provider of process automation tools for Microsoft Office 365® is pleased to announce its upcoming webinar entitled “Focus Your Digital Process Automation Efforts Squarely On Customer Outcome”, featuring Rob Koplowitz, VP and Principal Analyst, Forrester Research and Mark Graham, Director of ICT, Beaumont Hospital taking place on Wednesday, October 24th 2018. In this fireside chat webinar hosted by FlowForma, attendees of this webinar will hear first-hand how Beaumont Hospital wanted to drive process improvement. Mark and his team went straight to the doctors, nurses and others that work directly with patients and focused on improving that experience. Can't attend on the day? Sign up anyway as a recording of this webinar will be made available after the webinar!